What is Webpage Screen Resolution Simulator? The web page screen resolution simulator is actually a blank space that is used to adjust the resolutions of a web page in different modes. These simulators are available to use for free of cost and come with other bundled utilities suitable for marketing, designing, and development. Once you stimulate a web page, the customizable features enable you to change resolutions according to every possible device including notebook, desktop, tablet, Smartphone and even the television too. Even some simulators also enable you to customize the resolution manually. You just need to know the screen size of a particular device for which the website is being created. There is a list of online tools that are dedicated to testing the screen resolutions of a website. If you want a one-click solution rather than exploring the websites, there is also an option of installing plugins to your browser. For instance, Google Chrome is offering multiple plugins that can test a webpage in its runtime environment. A webpage Screen Resolution simulator tool will help you test your site with different resolution sizes to check responsiveness using our free tool. You can check in real time by entering your URL http://www.yourwebsite.com or http://yourwebsite.com, then select the required resolution size to test and click on the check button to simulate your site. The tool is completely free to use without downloading any external software, the tool supports all kinds of top browsers like (chrome, Firefox, Opera, Internet Explorer(IE)-11 etc) with any type of operating system. Nowadays webpage should be responsive for all devices like desktop, tablets, smart-phones and other devices. 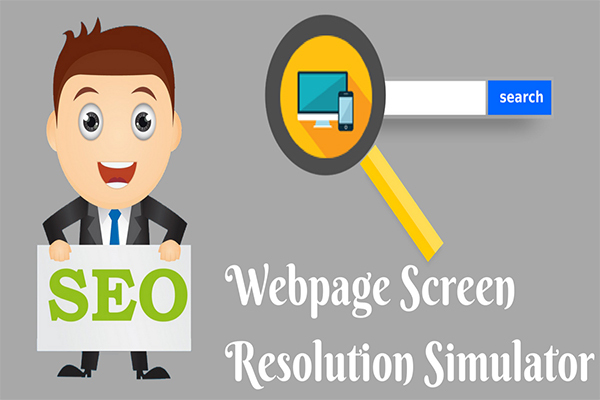 With the help of Screen Resolution Simulator, the user can able to check different resolution size for the web page using various resolution parameters in a new window. There was a time when the internet was only accessible through huge desktop monitors in almost the same resolution everywhere. Therefore, the size adjustment of web pages was not an issue. However, the circumstances are changing as technology is evolving. Websites are now accessible through devices of different resolutions such as Smartphone, tablets, laptops and even wearable gadgets like Smartwatch. Therefore, it is essential for a web developer to make sure that the website is facing no compatibility issue with any resolution. For the checking of this factor, you need a tool that can transform your webpage in all desired resolutions. There is no need to find any dedicated software if you want to check the resolution of a webpage. There are some online tools meant for this purpose. You just need to know the URLs of some websites that provide such kinds of tools. These are the simulators where you can enter the web address to see all compatible modes. One can test the website in various screen resolutions to make sure that it will work finely after launching on the server. Why do we need a Webpage Screen Resolution Simulator tool? When it comes to the designing & development of a website, the only factor that matter is user experience. If the end user is feeling comfortable for using a website in his/her device, you can utilize its complete potential. A website comprises different sections such as content, video links, online forms, and buttons etc. When you open a particular webpage in the device, it is possible that you might not be able to access its all functions. If the page is poorly designed, some buttons or content will be inaccessible. You can check this problem without operating all these devices physically. Just enter select the device type from its available options and to check whether all functions is working or not. If any issue is occurring, they can easily rectify before launching on the server. At a single time, your website might be accessed by numerous devices with different resolutions. Every device has its own resolution & it is the duty or designer to make it compatible with everyone. If the page is not compatible with display resolution, the user will not be able to access its complete content. Every website is meant for the purpose of gaining maximum traffic by implementing all digital marketing strategies. However, all strategies will go worthless if the resolutions are not optimized. As mentioned above, it's all about the user experience. If the end user is facing difficulty in accessing, they will jump to another website of similar products or services. NO matter how perfect your marketing campaigning is, if the end user is not satisfied with the accessibility functions, your website will surely lose visitors soon. There must be some errors from the front end that you will notice after finishing the task of designing and development. The screen resolution simulation tool is helpful in identifying those errors so that the page will become flawless before launching. The screen resolution simulator is the easiest way to check the resolution of a web page. The main objective of these simulators is to show the content of a webpage in various resolution. When the size of a page is increased or decreased, it will directly affect front end development. If any issue is occurring with the functions or displaying content while adjusting the screen, the user will not visit the website again. Apart from testing in a simulator, the only way to check the resolution is by using actual devices for accessing a website. Practically, it is very expensive because you cannot afford all devices including different tablets, desktops, smartphones, and televisions. Rather than investing in these all devices just for testing purpose, seeking help from a simulator is a much smarter option. It is not only meant for web designers but also a productive tool for search engine optimization experts. After updating new content on a website, they can check its compatibility with different resolutions. It is essential to be sure that entire content is adjusting in the targeted page without any kind of distortion. If it is not organized properly, the crawlers of the search engine will not be able to index a page accurately. This flaw finally affects the ranking of a website. How does the Webpage Screen Resolution Simulator tool work? Open the online tool and you will find a page where space for entering the URLs will be provided. Copy the link of your website and paste it in the URL section. Right below the URL, all resolutions will be mentioned from 160X160 pixels to 1600X1200 pixels. You can select any of these resolutions according to the capacity of the device. For instance a notebook of 1366X768 pixels resolution. Click on the check button and a new window will appear illustrating the desired resolution. In this new resolution, you check the functions and the entire content of a website to make sure that it is working properly. If any content is going out of the resolution, the designer can customize it again. Mobile first indexing already rolled out by Google and it has become essential for every website to become compatible according to the resolution of Smartphones. It the website is not optimized accordingly, the crawlers of Google will not index your website properly. A large criterion of internet users are already accessing through Smartphones and their number is aggressively increasing. If you want to stay in the competition, the adoption of change is the only option. The search engine optimization for every device differs on the basis of resolution. For instance, the SEO for mobile sites and apps will be different from desktop sites. If your website is not optimized according to all popular resolution, there will always be issues regarding its marketing. For effective digital marketing, designing and development are also equally responsible. If the resolution is not compatible with the content, it creates difficulty in crawling that ultimately affects the ranking. In short, the search engine optimization of a website will be successful only when its resolutions are optimized according to the perfect placement of content. For instance, if the area of a website is not working properly where keywords and backlinks are mentioned, it will directly affect your ranking. During the designing and development phase of a website, you need some effective tools that can check for real-time errors. The errors can be from both back end and front end. These flaws directly affect the user experience which is most important than any other objective of a website. The errors with resolution adjustment can be rectified only with the help of a webpage simulation tool. You can enter the link of every page individually to make sure that its content is organized accordingly. If any error becomes apparent, it can be rectified instantly so that users will not have to face any problem once the page becomes active on the World Wide Web. From the above information, it is clear that a webpage simulation tool is essential for both designers as well as marketers. Without optimizing a page according to the resolutions of desktop, tablet, notebook, and smartphone, its launching is worthless. A web page screen resolution tool will help you to check visually how elements are responding to different resolution sizes for responsiveness. Use of this tool will help you improve Search Engine Optimization for a different type of devices. Increases website traffic from social media, mobile, a tablet from different media and gain maximum ROI. Checking website or webpage with different resolution sizes will help you to find issues and helps you to build better user experience. You can check unlimited sites without registration or downloading software. The main aim of the tool is to check the responsiveness of your site.